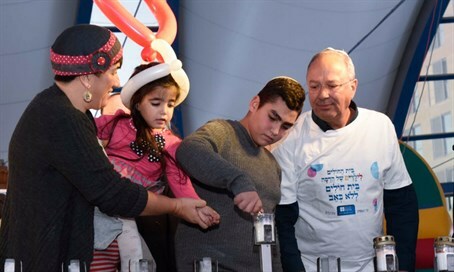 Hadassah children's hospital held a special Hanukkah event on Tuesday afternoon for the children of Jerusalem at the Cinema City complex, in an event more than 3,500 residents of the capital took part in. Among the participants was Tahel Sofer, the three-year-old girl who was burned and moderately wounded in October by an Arab firebomb attack on her family car outside of Beit El in Samaria. Sofer, who was just released from the hospital last month, was not the only young terror victim present. Thirteen-year-old Naor Ben-Ezra, who was stabbed and critically wounded by two Arab terrorists his own age in Pisgat Ze'ev in October and operated on at Hadassah Ein Kerem, also took part. The two young terror victims took part in lighting the third candle of Hanukkah. "My personal Hanukkah miracle is to be here, to be alive," said Ben-Ezra, who in another few weeks will celebrate his bar mitzvah. "At Hadassah they brought me back to life, and I light the candles today with very great excitement." Prof. Eitan Kerem, director of "Hadassah Children," noted that the close connection between the hospital and Jerusalem residents began 100 years ago, and that the medical staff decided to make a gesture to children of the city in honor of Hanukkah so as to cheer them up. "We are always with you, not only when you hurt. And when you need to heal, we at Hadassah know how to do that without pain and with great compassion. We all march together, because we are all a firm light."